There's no more revered name in the history of synthesis than Moog, and the Voyager XL aims to cement their reputation for top‑flight instruments. Is this the Rolls Royce of the synthesizer world? If you're a keyboard player, there's a fair chance that you've lusted after a Minimoog at one time or another. Unfortunately, there are only a few thousand of these to go round, and the last was built in 1981, so there was huge anticipation when Bob Moog regained the rights to his own name and announced the forthcoming release of a new Minimoog, to be called the Minimoog Voyager. Yet when it arrived, in 2002, its impact on the keyboard world was less than one might have expected, perhaps because it was released too soon; the first versions required a flurry of software upgrades as well as some rather annoying hardware fixes before the initial specification was met. But if you still think of the Voyager in this fashion, your perceptions are out of date, because it has for some years been a well‑implemented and, as far as I am aware, bug‑free instrument. So, following our reviews of earlier limited editions such as the Signature (2002) and the Anniversary (2004), the release of yet another special edition — the Minimoog Voyager XL — seems the perfect excuse to re‑evaluate the Voyager and to see what it offers in 2011. The Voyager XL is essentially a semi‑modular version of the standard Voyager, with a five- rather than a four‑octave keyboard, a ribbon controller and, most obviously, extensive CV routing options built into the front panel. But before we look at what's new, let's explore the common ground between the XL and its Voyager forebear. Like the standard Voyager, the XL's sound sources comprise three oscillators, a noise generator and an external signal input, with oscillator sync and the ability to derive their waveforms from a continuum ranging from a triangle wave at one extreme to a tight pulse wave at the other. You can modulate the waveshapes of all the oscillators, for a wide range of PWM effects, you can use Osc 3 as a modulation source, as on the original Minimoog, and there's also a dedicated LFO with triangle, square and S&H outputs. Next comes the five‑channel mixer. This offers an effects loop that allows you to insert external devices into the signal chain before passing the sound to the filter section, which comprises two resonant filters that can be configured either as parallel low‑pass filters or as a LP/HP pair in series. The difference between the two filters' cutoff frequencies is determined by a single spacing control rather than a pair of frequency knobs and, somewhere among the Voyager's numerous software upgrades, this became a programmable modulation destination, which is good news. Unfortunately, the filters in the review model don't track the keyboard at exactly 100 percent, nor do they track at the same rate as each other, nor can you modulate their resonances separately. But to analyse the Voyager's filters on the basis of what they can't do is (perhaps) to miss the point. Whether used in their 6, 12, 18 or 24dB/oct modes, they have the classy timbre that made the Minimoog so special and which remains almost impossible to obtain elsewhere. The ADSR envelope generators in the XP are satisfyingly snappy and, as well as being hard‑wired to the filter cutoff frequency and the audio signal amplifier (which makes basic programming nice and straightforward), they can also be used as modulation sources for all manner of esoteric purposes. Unfortunately, and in common with another Moog product reviewed recently, the Release On/Off switch doesn't reduce the release time to zero, it merely curtails it, which seems wrong to me. Modulation on the Minimoog was horribly limited, with just two sources and two destinations. In contrast, Voyagers offer two modulation buses on their control panels, with what appear to be eight sources, seven destinations, and four 'shaping' options. However, these buses are more flexible than they seem because they can draw upon an extensive range of additional options in the menu system (of which more later). In addition, the introduction of the strangely named — but in my view essential — Pot Mapping modulation matrices (see 'Pot Mapping' box) hugely expanded their modulation capabilities and eliminated some significant oversights in the original specification. Moog made a big deal of the Voyager's Touch Surface Controller when it first appeared, but this was (initially) next to useless because it was permanently connected to the filter. Happily, Moog corrected this quite early in the synth's history, as well as the pad's inability to retain its CV information correctly when you lifted your finger from it. With 32 destinations for each axis, plus 14 Gate destinations, it has become an exceptionally flexible modulation source, so I was at first curious as to why a synth would require both a touch‑pad and a ribbon controller. I soon had my answer, finding myself patching them to do different things. Unfortunately, the pad's position to the right of centre on the XL's panel may render it less useful than it would otherwise be for the majority of (right‑handed) players. The final elements in the standard Voyager's architecture lie in its editing system. In addition to programming the aforementioned Pot Mapping and filter cutoff slopes, this is where you'll find facilities such as the Alternative Gate sources, 43 additional Shaper sources for the modulation buses, and much more. It's also where you can organise your sounds into categories, stack multiple Voyagers into hyper‑expensive polysynths, choose from three user‑selectable velocity curves, and select from the available key priorities and trigger modes to tailor the way in which the XL will respond to your playing. You can even transpose the keyboard locally and separately with respect to incoming (or out‑going) MIDI note numbers, which is neat. The front panel of the Voyager was certainly luxuriously furnished, but the Voyager XL's is further augmented by the addition of the CP251 and VX351‑based patch panel at the left. So far, I've described nothing that's not available on the standard Voyager, and although the patch points to the left of the XL look new, many of them are not. The original Voyager had 18 analogue inputs and outputs on the back of its control panel, but only four of these — the external audio input, the effects loop and the stereo audio outputs — have survived in that position on the XL. The other 14 (which are all CVs and Gates) have migrated forward and now appear as the CV Inputs section on the synth's front panel. Unfortunately, while these make it possible to control the Voyager using external devices, they aren't complemented by outputs that allow it to control those devices in turn, nor can you patch new control routings on the Voyager itself. 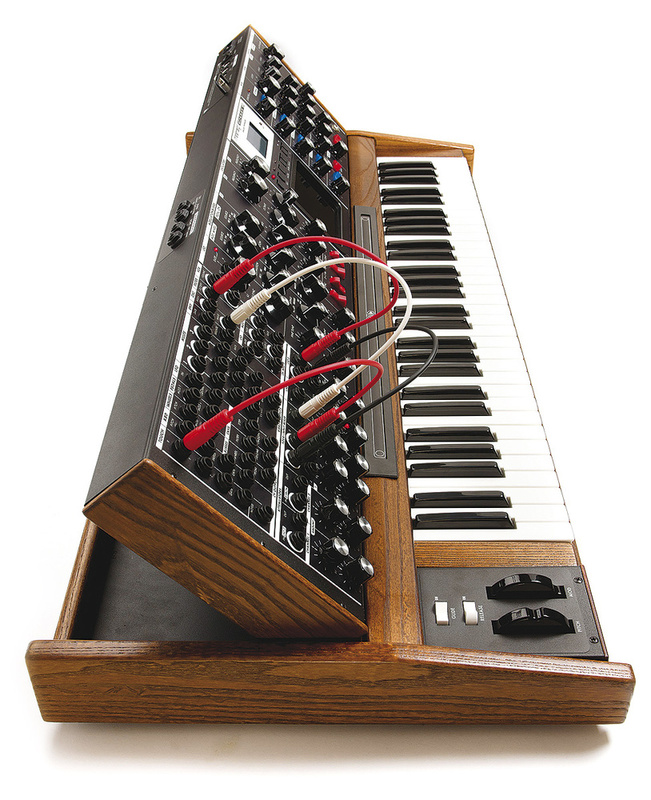 So, for the original Voyagers, Moog released the VX351 CV Expander which — provided you were prepared to open your synth to install a piggy‑back board — derived a bunch of output CVs from the 25‑way connector on its rear panel and presented them to the outside world on quarter‑inch sockets. To be honest, I always felt rather cheated by the need to modify my expensive synthesizer in this way but, once attached, the VX351 proved to be indispensable. Happily, the XL now incorporates all the CV outputs from the VX351, and even offers two extra ones. These are the CV and Gate generated by its 500mm ribbon controller, and it's just as well that these are included because the ribbon isn't hard‑wired to anything so, without patching, it does nothing. The final set of facilities on the XL are derived from the Moogerfooger CP251 Control Processor, which incorporates two attenuators, a simple LFO, a S&H generator, a slew generator, a noise generator, a mixer and a four‑way multiple. With the exception of the noise generator, these are all recreated to a greater or lesser degree on the XL. For example, the XL's dual attenuators offer offset knobs as well as the CP's amount knobs, and these allow you both to attenuate the signal and apply a DC offset. What's more, their inputs are normalled to a new LFO and the XL's ribbon controller, which clearly wouldn't have been possible on the CP251. Demonstrating even greater differences, the CP251's LFO and dedicated S&H section have been replaced by LFO2, which offers six waveforms (including two forms of S&H), MIDI sync, a lowest frequency of around 0.02Hz for long sweeps, and the ability to output different frequencies and waveforms from its positive and negative polarity sockets. In contrast, the lag processor appears to be the same on the XL as on the CP251, as does the CV Mixer, which retains the CP251's high bandwidth and can be used for mixing audio signals as well as CVs. The omission of the CP251's noise source on the XL is interesting. I seem to remember that the noise generated by the CP251 is richer in high frequencies than that generated by the Voyager itself, but taking the noise signal from the XL's patch panel and feeding it back into its external audio signal input demonstrates that it's the same signal as you obtain from switching noise on in the audio mixer. Strangely, the polarity is reversed, and by balancing the levels of the external input and the noise generator, I could cancel the two almost perfectly. I wonder whether this was intentional? The final element in the CP251 is a four‑way multiple. At first sight, this appears to have gone AWOL, but given that there are three multis on the XL's CV panel, and the VX351 had just two, it's clear that the CP251's has simply moved north a few inches. Unfortunately, while the multis can all drive expression pedals, I suspect that they remain unbuffered, because voltages can droop when you send a single CV to multiple destinations. Not serious when using them to help create sound effects and complex modulations, this can be a problem when signals passed through them are used to control the oscillators' pitches. The Voyager XL's back panel features an IEC input for the built‑in power supply, an on/off switch, MIDI In, Out and Thru ports, two connectors for optional gooseneck lamps, an external audio input, an effect loop insert port and stereo audio output sockets, these last four on quarter‑inch jack sockets. Getting started with the XL couldn't be easier. Stick it on a sturdy stand, plug it in to your mixer or amp, plug in a standard mains cable, and switch on. Not only does it avoid the use of a wall‑wart (hurray! ), it also incorporates a universal power supply so you don't even have to worry about voltages and mains frequencies. You may now be tempted to start working your way through the 1024 factory sounds, but I recommend that you first set up the keyboard priority and trigger modes to your preferred playing style. Now start playing. Like the original Voyager, I found the XL's keyboard action to be entirely appropriate for monosynth duties, and I loved having the extra range available for soloing. More surprisingly, I found that the XL was equally suited for use as a five‑octave velocity‑ and pressure‑sensitive MIDI controller. It's fair to say that early Voyagers had numerous MIDI deficiencies, but those are now in the past. I tested the XL as a controller keyboard and it proved quite adequate, sending velocity and aftertouch messages correctly, as as well MIDI CCs from almost every front‑panel control. And, at the other end of the scale, I used a small Arturia controller keyboard to play and control the Moog without any problems. But what if you're an analogue die‑hard and want to avoid MIDI? Back in 2003, I wrote, "I see no reason why Moog couldn't have made the Voyager a little larger, and incorporated everything into one case... if you were to add the VX351, and extend the synth even further with a Moogerfooger CP251 Control Processor, it starts to look as if [a modular synth] is the final target.” Hooking the XL up to my Analogue Systems RS8000 — both as the controller keyboard and as part of the sound generating mechanism — yielded excellent results as well as providing endless hours of fun. Nonetheless, please don't be confused about its underlying nature. Forget the fact that you can't insert or remove modules, as on a true modular synth. With the exception of a couple of fudges, there are no ways to tap the audio signal path, so the XL occupies the same semi‑modular territory as the Korg MS20. This may seem strange, because if there's one company that could make money out of selling genuine modular synthesizers, it should be Moog, but it seems that the company have decided not to go that route. While reviewing the XL, I became aware of a couple of improvements over the original Voyager that are worth mentioning. On early models, you couldn't use the synth with its control panel laid flat because its weight rested on any cables that you inserted. Whether by raising the panel a touch or by shaving the wooden bar at the rear of the synth, this now seems to have been corrected. Another fault on early versions concerned the synth's response to the pitch‑bend wheel (which was asymmetric) and the fact that the whole thing went flat as you increased the maximum pitch‑bend interval. This was fixed when the Anniversary Edition appeared a few years ago, and is no longer an issue. So do I have any concerns about the XL? Of course I do, and here's a short wish–list that would make it an even better synth. 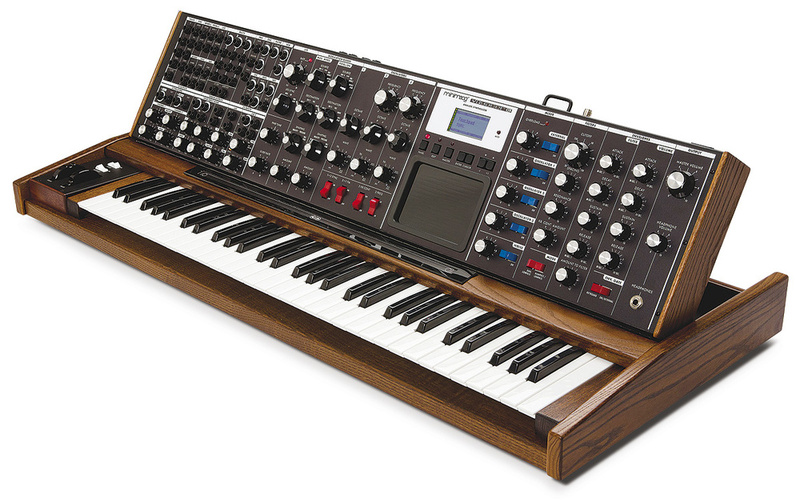 Firstly, please can we have the Minimoog's A‑440 oscillator back? This is almost essential on a synth that has no fixed tuning. My second wish concerns the filter topology. As it stands, you can switch the Voyager's filters between series (HP+LP) mode for single‑channel band‑pass effects, and parallel (LP+LP) mode, with the output of each filter passing to a separate output channel. But wouldn't it be great if the dual‑LP mode was also available in series? The Cwejman S1 MkII shows what can be achieved with slopes of greater than 24dB/octave, and slopes of up to 48dB/octave would allow us to create some powerful new timbres on the XL. Thirdly, I wish that the XL's voltage processors were not modelled quite so closely on the CP251's because this means that there's still no patchable VCA. I thought that this was daft on the original expander, and I still do, so can we have one (or more) please? Pretty please? Finally, I would like to moan about being asked to pay $79 for the Voyagers' editor/librarian. If I'm going to cough up over four grand for a synth, I don't think that it would be unreasonable for this to be included. So, at last, we come to the sound of the XL. It might seem strange with such a huge library on tap, but I'm not a huge fan of the factory patches because too many strive to be big, fat, noisy and impressive. One of the great joys of early Moog synths was finding that a gentle waveform generated by a single oscillator could sound musical and involving, and so it is with the XL. Coaxing classic monosynth sounds from it is a pleasure, and then invoking facilities such as Pot Mapping to provide additional performance controls and extra modulation is even more so. Mind you, while the XL can sound like a Minimoog, it doesn't always do so, even if that's what you're trying to achieve. For example, the famous behaviour of the original, in which the amount of filter resonance decreases as the cutoff frequency decreases, is not replicated. But this is probably irrelevant because, when you start to use all the extra capabilities of the XL, the Minimoog can only watch as its descendant disappears over the sonic horizon. From common facilities such as PWM and sync, to the dual filters, to the selectable filter cutoff slopes (which make it capable of creating sounds reminiscent of other revered synths such as ARPs and early Korgs), to velocity and pressure sensitivity, to the myriad patching options and software-controlled modulation capabilities... the XL demonstrates the huge gulf between 1971 and 2011. What's more, it does so in a way that doesn't detract from its sound, which is greatly to Moog's credit. Consequently, powerful bass and creamy lead sounds ooze out of it unbidden, while MS20‑style basses and all the squelches and farts of electronica and dance music are just a filter tweak away. It's pretty good at orchestral imitations too, and I was pleased by the quality of the flutes, solo strings and brass patches that I could coax from it. Then there are the noises and effects; start using the hardware and software patching and you'll create them effortlessly, although whether they'll be the ones you wanted is another matter! If money were no object and I was looking for a genuine analogue — umm, well, analogue/digital hybrid — monosynth (with all the strengths, weaknesses and limitations that that implies) then, short of a large cabinet of high‑quality synth modules, I'm not sure what I could buy that would do a better job. Voyagers retail for between £2350$3295 and £2600$3570 depending upon which type of wood you prefer and which colour of LEDs you choose to light its controls and parameter values. (Maple Fire or Mahogany Indigo, sir?) Add to this a maximum of around £550$763 for the VX351, the CP251 and their rackmount kit, and you have a total price lying between £2900$4058 and £3150$4333. This means that the Voyager XL will cost you somewhere in the region of £1000$660 to £1200$900 extra for a ribbon controller, a 61‑ rather than a 44‑note keyboard, and the convenience of losing a couple of connecting cables. It's clear that — even allowing for the improvement in ergonomics when compared with the Voyager/VX351/CP251 combo — you can't judge the Voyager XL by any conventional price/performance criteria. But over the past few weeks I have shown the review unit to a number of experienced and gear‑jaded keyboard players and, without exception, their responses have centred around "Wow!” and "Oooooo!” In short, the Voyager XL does to keyboard players what catnip appears to do to cats. Nonetheless, most people would view you as certifiably insane if you were to consider spending more than £4000$5000 on a semi‑modular monosynth, let alone one that offers no esoteric filters, sequencers, quantisers, frequency shifters, ring modulators or effects, and they could point out that there's nothing new here; the XL merely rehashes existing technology that can be obtained cheaper elsewhere. But they would have missed the point. So I'll repeat myself. You cannot justify the XL in terms of price, performance, convenience, or any other sensible criteria. A wise man once said, "Keep only that which you believe to be beautiful or know to be useful”. Few synthesizers have embodied both of those attributes and, despite the niggles, the Voyager XL is both gorgeous and sounds great. I couldn't justify buying one, but I'll lust after one nonetheless because it reminds me of why I wanted to play synthesizers in the first place. Pot Mapping comprises four modulation paths that can be used together with, or completely independently from, the modulation buses on the front panel. There are four parameters for each path — source, destination, polarity and amount — and with 40 sources and destinations (each of which can be used multiple times if desired), the range of routing possibilities is astronomical. Happily, setting everything up is simple — much simpler than the control-panel buses — and (for example) turning the Voyager XL into a synth with touch‑sensitive brightness, loudness, vibrato and growl takes just seconds this way. The Voyager became a hugely better synth when Pot Mapping was introduced; it's only a shame (although an entirely understandable one) that its destinations are confined to the standard Voyager facilities and have not been extended to the new modules added on the XL. If you want evidence that the Voyager XL isn't a purely analogue synth, you need look no further than its edit menus, where numerous control thingies are routed from sources to destinations by software. If you want to prove it audibly, try sweeping two knobs rapidly while listening to the resulting changes in the sound. Whereas sweeping one results in a smooth 'analogue' response, asking the processor to handle two simultaneously results in a faint, but perceptible stepping. But don't worry. Nobody except you is going to hear it and, given that the audio path is analogue from start to finish, I don't think that you should give a damn. The Voyager's rear panel CV and Gate inputs are reproduced in full in the XL's CV Inputs panel. Mod Mod 1: external control of the pedal bus Mod 2: external modulation source. Sample & Hold In, Gate. The VX351's CV and Gate outputs are also reproduced in full on the Voyager XL. Touch pad X, Y, A and Gate. Keyboard Pitch, Velocity, Pressure, Gate. Pedals MOD 1, MOD 2. Sample & Hold Output, Smoothed Output. Additional CV outputs (not on VX351) Ribbon CV Out, Ribbon Gate Out. Something akin to but not identical with the CP251's voltage processors are offered on the Voyager XL. Attenuators x 2 With positive and negative ranges and DC offsets. Four‑input mixer Two channels with attenuation, two without, final mix with global offset and overall gain; positive and negative outputs. Lag processor Independent control over rise and fall times. Range: 1ms to 1s. LFO2 Six waveforms, frequency range 0.02Hz to 20Hz. Independent frequency and waveforms on positive and negative outputs available using MIDI. ... but given the price, it may be unrequited lust, I'm afraid. The Voyager XL is a large and heavy lump of synthesizer that reminds me of gigging in the 1970s, in more ways than one! But it looks gorgeous and it sounds great. Unfortunately, I suspect that almost as many will end up in display cases as will find their way onto the stages of the world. You can't justify buying one on a price/performance basis, but as an object of desire it's possibly in a class of its own.